above: Cobblers' Bridge (a.k.a. Shoemakers' Bridge) got its name from the many past shoemakers' workshops on the bridge. It was designed in the 1930s by Jože Plečnik to serve as a town square above the water. On each side are six pillars, which remain from the originally planned roof. 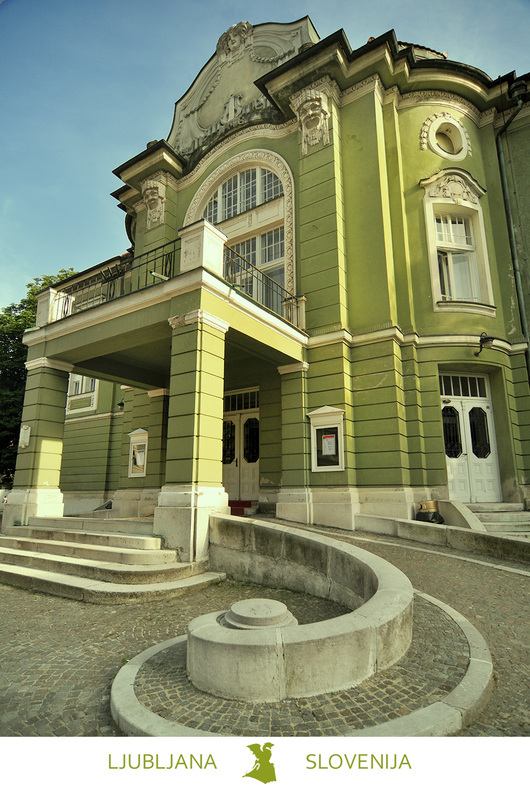 right: The Slovenian National Drama Theatre of Ljubljana (SNG Drama Ljubljana) is Slovenia's main dramatic theatre. The building was constructed in 1911 by Viennese architect Alexander Graf and is an exact copy of Graf's theatre in the Czech town of Ústí nad Labem. Its exterior is adorned with Art Nouveau ornaments that were popular at the beginning of the 20th century. below left: One of Ljubljana's best known Baroque monuments is the Robba Fountain in front of Town Hall at the Mestni trg square. 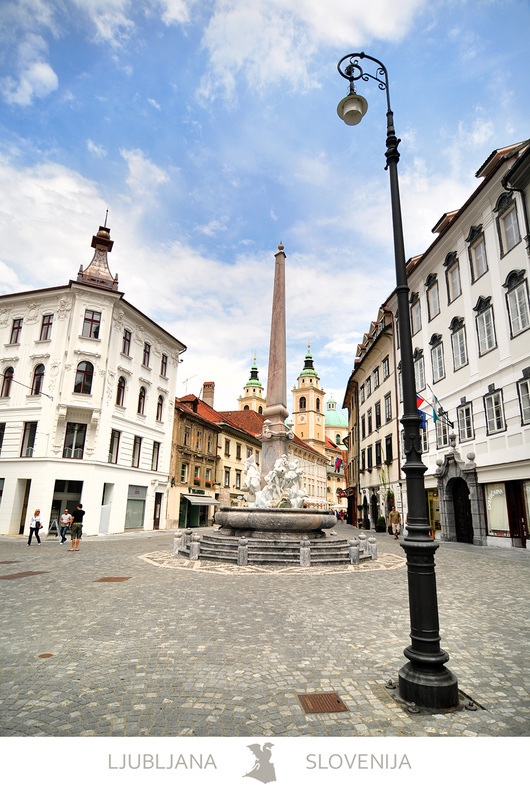 The monument is also known as The Fountain of Three Carniolan Rivers (the Sava, the Ljubljanica and the Krka) and was carved from Carrara marble and local stone in the mid-18th century by Venetian-born sculptor and architect Francesco Robba, who spent most of his life in Ljubljana. below right: Jože Plečnik (1872 - 1957) was a Slovene architect who practiced in Vienna, Belgrade, Prague and his hometown Ljubljana, where his influence as an architect is most noticeable. He transformed many bridges, banks of the Ljubljanica River, central market, parks, plazas, some key buildings... resulting in a unique, aesthetically integrated town. 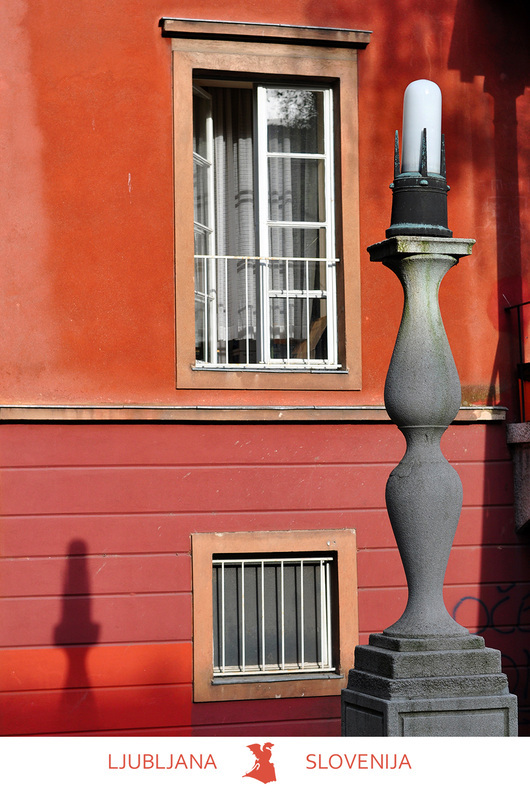 The picture shows one of his common lamp designs, which helps cast his architecture in the spirit of antiquity. below: The Ljubljanica River shares its name with the city, although it is impossible to say with certainty what was named first. Its name probably comes from the Latin "aluviana," the flooding river, but the romantic souls here say the name comes from the Slovene word "ljubljena", which means beloved. Today its green banks attract much activity and are a popular hangout. below: Each December Ljubljana adorns its fairy-tale charm with the light installations Cosmic Ljubljana, Path of Life, Birth of Forms and Bearers of Light by the artist Zmago Modic. The streets and squares come to life with fairs, a big Christmas market of food, drink and craft stands, processions, acts, concerts... all month long, the whole Merry December as we call it in Slovenia.